The annual Brookings Blum Roundtable is an off-the-record forum for global leaders, entrepreneurs and practitioners to discuss innovative ideas and advance groundbreaking initiatives to alleviate global poverty. 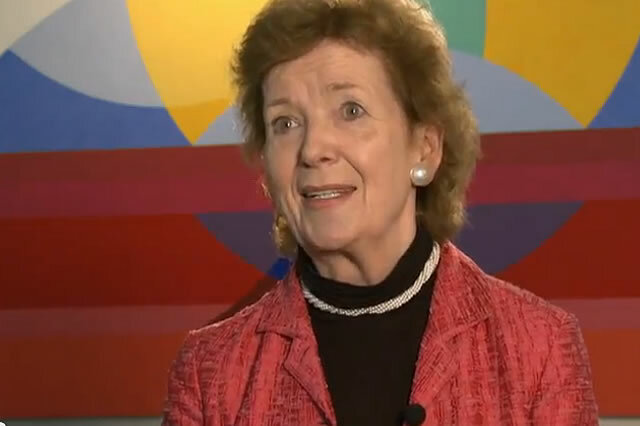 Mary Robinson attended the annual Brookings Blum Roundtable — an off-the-record forum for global leaders, entrepreneurs and practitioners to discuss innovative ideas and advance groundbreaking initiatives to alleviate global poverty. This year’s theme was “Innovation and Technology for Development.” New technologies offer the promise of breakthroughs in development and poverty alleviation by spurring innovative business models and pushing down transaction costs in the developing world. Mary Robinson delivered the introductory remarks for the Session titled Innovation and Technology for Green Growth which was moderated by Al Gore. Participants explored the following questions for the roundtable: How advanced is green growth technology vis-à-vis the scale and urgency of the global climate challenge? What is the role of pricing and intellectual property and push and pull mechanisms in speeding up propagation within developed and developing markets? How can the goal of “sustainable energy for all” be achieved, and is it feasible in all countries?